Thus begins the card game called Falling: The Goblin Edition. 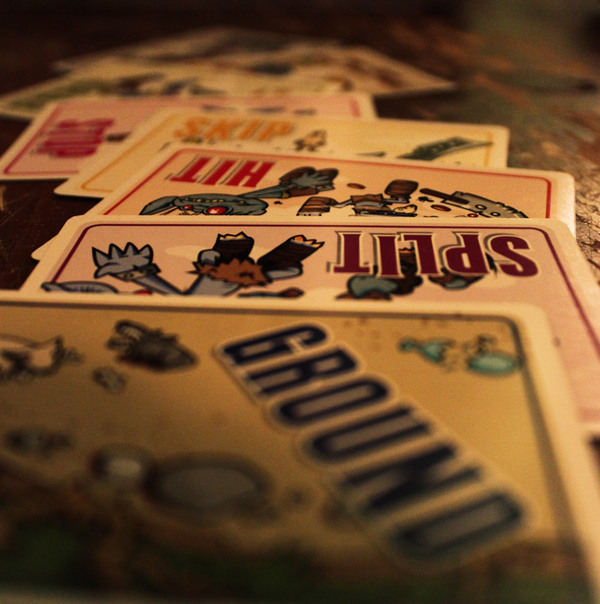 Falling is a simple, fast paced card game for up to 8 friends. It takes about 5 minutes to explain the rules, though the game is best learned by playing through a few rounds – which are very, very short. I was not lying about fast-paced. The concept behind Falling is simple: you are goblins, and you are falling. As the instructions note, it doesn’t really matter where, or why – but there are a lot of goblins, so some of them are bound to be heading towards the ground. These falling goblins have decided to make a game out of it – to see who can hit the ground last. That’s it. Fairly simple stuff. The game plays out in real time, with one player acting as the “dealer” (or perhaps, gravity?) and the other players are falling goblins. When I say real time, it works like this: the dealer deals out cards to each of the players decks, one at a time, going round the circle as fast as he likes (or is able) until all the players hit the ground (represented by 7 cards always at the bottom of the deck labelled “ground”). Meanwhile, the players can pick up the cards they are dealt and play them on themselves or other players for a variety of results. Cards can cause players to be dealt an extra card, or to be skipped by the dealer, or to have their deck split into two. These actions can be stolen, pushed away, stopped, or even doubled by other cards. It’s a simple ruleset and it may not sound interesting, but in practice, this game is chaotic, hilarious, and fun. Everyone has to reach across the table to play cards on other players, getting in each others way and beating each other to the punch – since only one card can be played on any particular player at once, you have to be fast to get that “hit” in before a player plays a “skip” on themselves. Since the game runs its course so fast (after all, you can only delay the inevitable for so long…) no one feels left out, because in a few seconds the round will end and they’ll be back in. The high-speed nature of the game keeps players’ energy high, and rounds usually end with shouting and laughter as the remaining players fail to pull off any more stunts to keep from hitting the ground. Falling is a great game to pull out quickly in a group. I almost always grab my deck when heading to any social occasion – because it’s such a quick and easy-to-learn game, it can be easy to just start up a game if people are bored. The biggest downside of the game is if a player (or two) is not careful about keeping their deck and “rider” (the card played on them) separate, the dealer can get confused and has to stop for a few seconds to sort things out. But even when that happens, its only a few seconds, and the game keeps moving. At $9.99 a deck, Falling is definitely worth picking up just to have something more casual to pick up and play even if you have just a few minutes of time. I don’t see why you couldn’t pick up a second deck and combine it with the first to have up to 15 people playing, although that might be too many, given that the dealer needs to constantly, quickly go around to each player, the players have to lay cards in front of each other – but for 8-10 players, maybe, that would be a decent option. In summary, Falling is fun, fast-paced, and funny, and I can highly recommend it for just about anyone. If there’s a game you think i should try, let me know – I’d probably be willing to give it a go. And maybe a review! Also, I’m considering doing “video reviews” of board games to have a more visual way of showcasing a game. And I haven’t seen too many video-reviews of board games out there. Thoughts on that? Good idea? Bad idea? Previous ArticleFinding the Character: What Would Obre Do? I like the video review idea…and Falling. Any game you can whip out in a Chipotle on the fly is okay in my book. If you want to see some really well done video board game reviews you should check out The Dice Tower (http://www.thedicetower.com). The personally really enjoy video reviews over written reviews as I’m a very visual leaner and it gives me a better idea of the game than a written review. Huh. I actually find the Dice Tower guy terribly annoying. To each his own, though.